"My Mom has cooked this recipe for as long as I remember. Now that I live on my own, I can't wait to go back home over the holidays to have this excellent dish. Mom would probably be upset that I gave it away, but it is so delicious that I think everyone should have a chance to experience it. Technically shish kabobs use lamb, so these should be called beef kabobs, but this is the family recipe and what we call it." Whisk the vegetable oil, soy sauce, lemon juice, mustard, Worcestershire sauce, garlic, black pepper, and salt together in a bowl; pour into a resealable plastic bag. Add the beef, coat with the marinade, squeeze out excess air, and seal the bag. Marinate in the refrigerator 8 hours or overnight. Add the mushrooms to the bag, coat with the marinade, squeeze out excess air, and reseal the bag; marinate in the refrigerator another 8 hours. 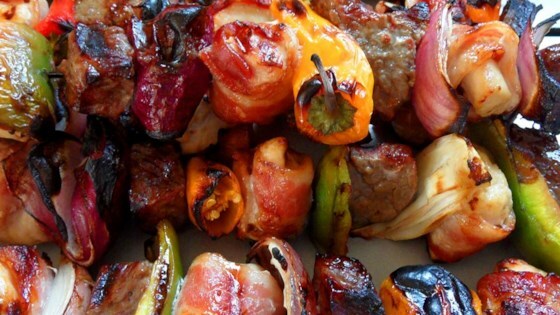 Thread pieces of green bell pepper, beef, red bell pepper, mushroom, and onion onto metal skewers, repeating until all ingredients are skewered. Marinated and grilled beef and vegetable skewers, just like mom's. Our first time making kabobs. We marinated the meat (but not the mushrooms) in a vacuum-seal bag for 2 hours and ditched the leftover marinade rather than saving for basting. Turned out great!